"The morning fog had prevented us from recognizing where we were, though we smelt the salt water of the sea. At noontime after having had several roll calls, the sun pierced through the fog and lifted the veil around us. We found ourselves on a small island, a rock in the sea." - Former Prisoner of War Wolf Dieter Zander. 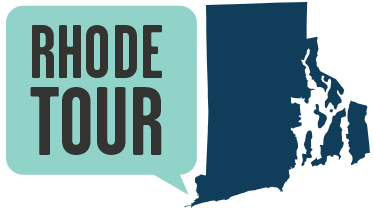 Few Rhode Islanders remember the German Prisoner of War (POW) camps in RI. Fewer people realize that as they drive into Fort Getty, the stone gate posts were built by the German POWs encamped there in 1945. Ellen Brownell, a local Jamestown resident recalled, "We had prisoners at Fort Getty. I remember being out with my doll carriage going down Hamilton Avenue and a truck going by with prisoners, hollering and waving to me." In 1945, the U.S. Army approved numerous "re-education schools" throughout the U.S. for German POWs. Five 60-day training sessions graduated 528 German POWs from the school at Fort Getty. The classes included English language, American and German history, and stressed democracy as a way of life. The prisoners were taught by academics from first-rate universities and were carefully screened, promising to help Americans in Germany after repatriation. POWs were anxious to be part of the program since they anticipated a quicker return to Germany and their families. Christian McBurney states "POWs were not allowed to stroll around town unescorted. However, they could use the beach near the school and a few residents remember seeing some of them on work details." Alcina Blair recalled two prisoners--who had gotten lost-- appeared on the front porch of her family's house on Windsor Street. "My mother and father were concerned and called the chief of police who came and got them. They were not escaping. They were lost." Only one POW, Gerhard Hetzfuss, escaped from Ft. Getty. He and his American girlfriend wanted to remain in the U.S. In 1900, Fort Getty began as a Endicott Period Coastal Fort. By 1905, three gun batteries were completed: "Battery Tousard" with 12-inch M1900 guns on disappearing carriages, "Battery House" with 6-inch M1900 guns on pedestal mounts, and "Battery House Whiting" with 3-inch M1903 guns on pedestal mounts. In 1948, the fort was abandoned. In 1995, it was sold to the town of Jamestown for $5,500. The purchase was narrowly passed by town residents: 159 to 114. Graduation Ceremony - Nov 30, 1945: Here are German POW students at their graduation ceremony. In addition to classes, the POWs had access to a library filled with American books, magazines and newspapers that had been unknown under the Nazi government. 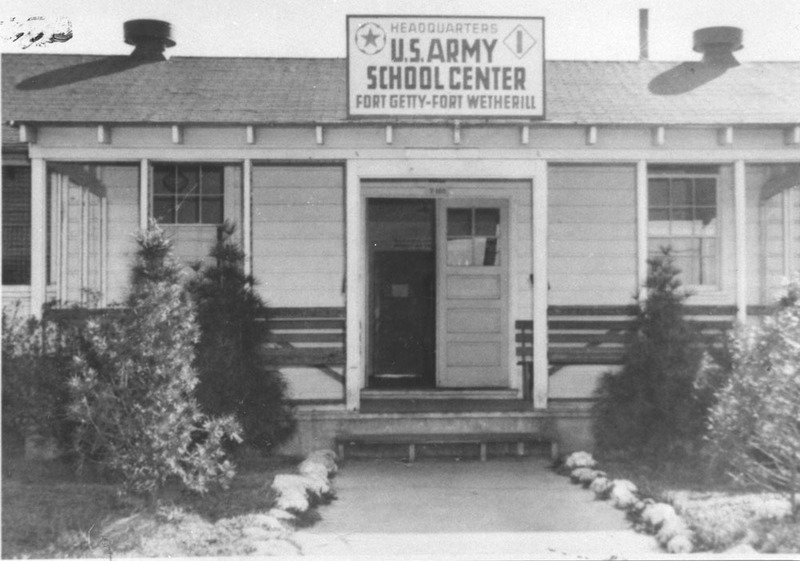 US Army School Center, Ft. Getty : Intelligence officers compiled lists of anti-Nazi POWs and set up an administrator's school at Fort Getty and a police school at nearby Fort Wetherill. 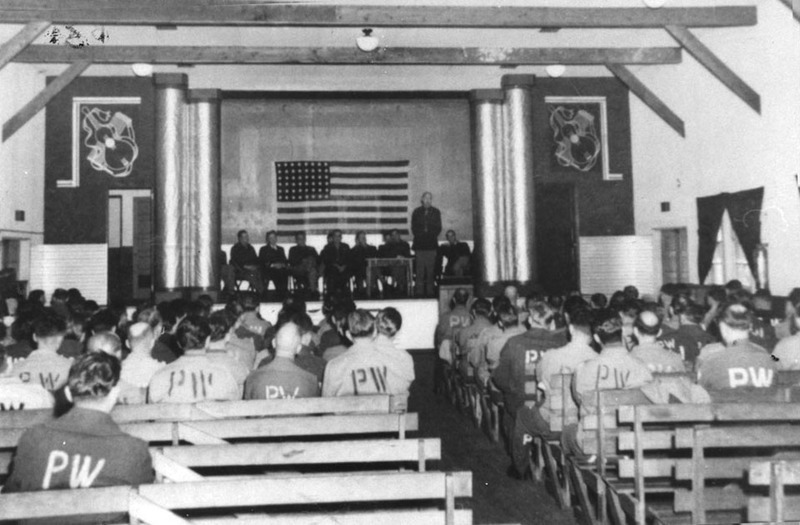 Officers were dispersed across the country to different POW camps to screen potential candidates that would become students. Ft Getty seen from North Pier, 1945: In 1941, forty temporary structures were built, including fourteen 63-man barracks and five mess halls. By 1942, almost all armaments were removed from the fort, except for a new anti-motor torpedo boat battery built in 1943. 12-Inch Breech-Loading Gun, c. 1940: This image shows the firing of a 12-inch breech-loading gun, similar to ones found at Ft. Getty, an M1895, on a M1897 disappearing carriage. The soldier in the foreground has just pulled the long firing lanyard, which can be seen stretching up to the breechlock of the gun. The gun is "in battery", raised just above the edge of the parapet of the gun position. 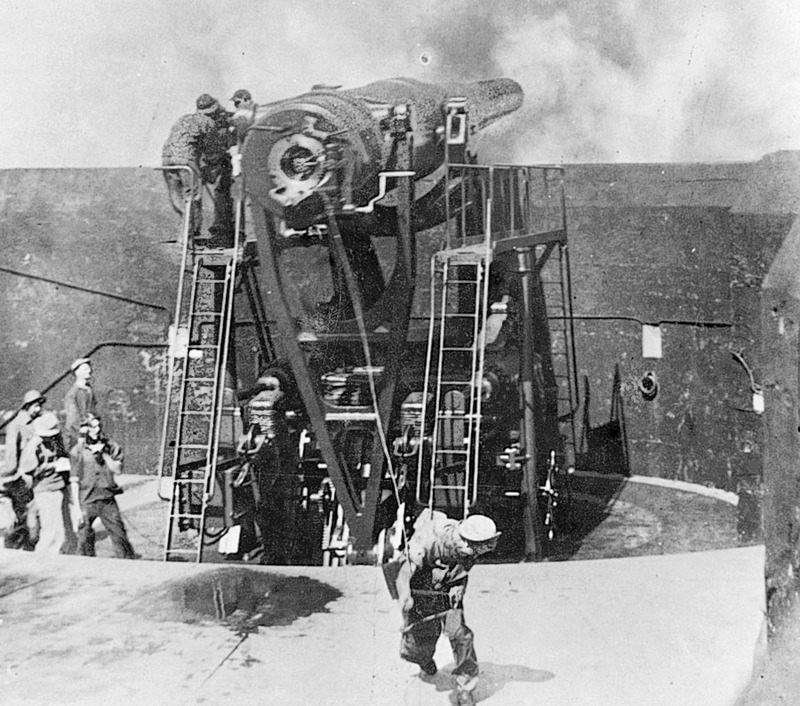 The crew member on the catwalk at the upper left of the gun is looking through the optical telescopic gun sight. On the left, the talker (wearing a headset) passes firing data from the Range Section of the battery to the man on the gun sight. 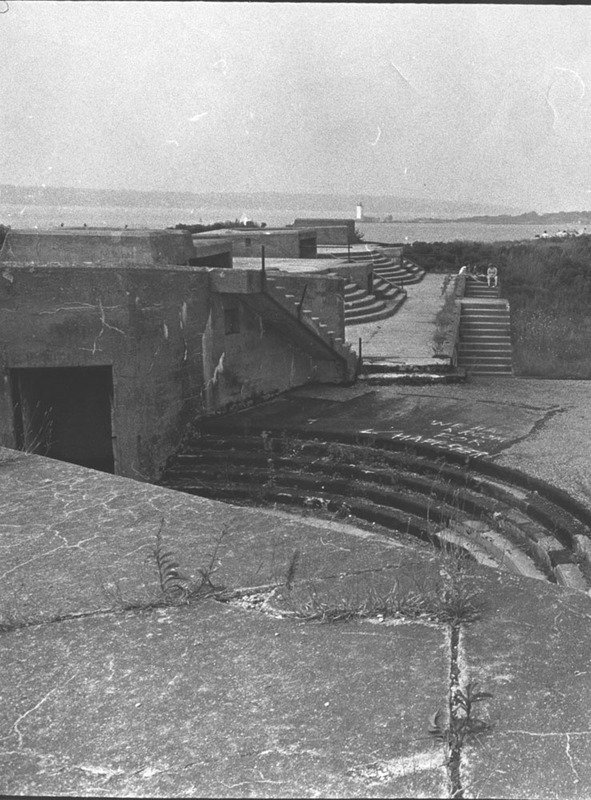 A Ft. Getty Battery after the Removal of the Guns: This photo was taken some time after 1945 and before 1970. It shows the remains of one of the batteries. In 1942 the 12-inch guns were scrapped, Battery House's guns were relocated to Fort Varnum, and Battery Whiting's guns were relocated to Fort Burnside. In 1948, the fort was disestablished, as were essentially all US coast defenses. Today, Fort Getty is primarily a recreational-vehicle campground. All that's left of its military history are the old fortifications, a rocky beach, a pubic boat ramp, and a dock. Here is a fascinating story from the Washington Post about German POWs scattered across America, including those at Fort Getty. Watch and listen to POWs talk about the American and German governments while at Ft. Getty. Jamestown Historical Society, “Ft. Getty's Prisoners of War (POWs),” Rhode Tour, accessed April 21, 2019, http://rhodetour.org/items/show/290. "Reminiscence of former POW Wolf Dieter Zander," The Prisoner-of-War Camps at Forts Getty and Wetherill in Jamestown: Reeducating World War II German POWs with the Best of Intentions. Christian McBurney and Brian Wallin. Small State, Big History. Ellen Brownell, Oral History, Jamestown Historical Society.